Some of the links in this post contain affiliate links. When I first decided to try Python months ago, the first obstacle I had to overcome was to figure out how to set it all on Windows. 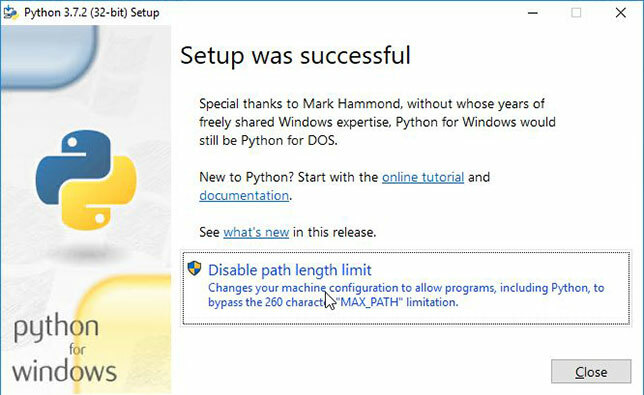 You install a Python on Windows, but then what. How do you create projects and run scripts? And that is the focus of this article. We will first install Python and then an editor from which we will make our Python code. Next, we will create a Python project and in it make a simple script and finally, we will examine how to install 3rd party packages. 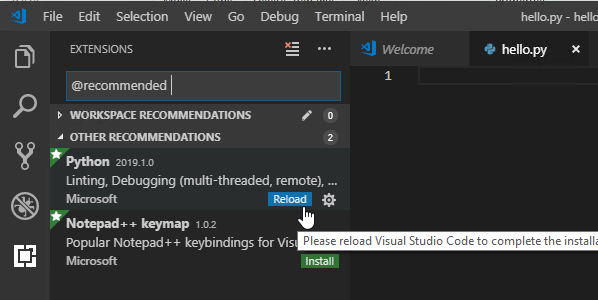 How to install Visual Studio Code editor. Creating a Python project and load it in the Visual Studio Code. Creating and running a Python script on the opened project. Installing 3rd party Python packages & libraries. 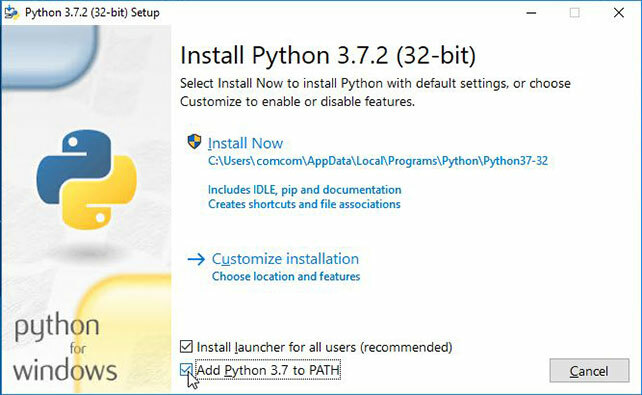 In this section, we will install Python 3 on Windows and after installation, we will test it if it was installed successfully. Save the file in your computer and run it. The User Account Control (UAC) window will show up and ask you if you want to allow this app to make changes to your device. 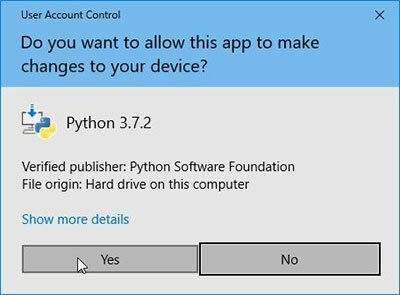 Verify, that the Publisher is "Python Software Foundation" and then click Yes. First, make sure you add a checkbox to "Add Python 3.7 to PATH" as shown above. With this option enabled, you can run python command anywhere from your computer. Next, click on "Install Now". This will install the default settings of Python, which should be fine in most cases. If you instead prefer custom installations, choose "Customize Installation". Installing should now proceed. Wait, until the setup progress is completed. When installation finishes, you should see "Setup was successful" message. In case you also see "Disable path length limit" option as shown below, click it, which will remove the Windows filesystem limitation of 260 characters. If you don't see this option and you are running Windows 10, it would mean that your Windows already has this path limit disabled. If you are running an older version of Windows, you most likely won't see this option at all and you will be limited to the path length of 260 characters. Note: To learn more about the mentioned Windows filesystem limitation, check this article. Now that the Python is installed and working, let's install an editor from which we will make our code. We don't need any special editor to write code in Python. 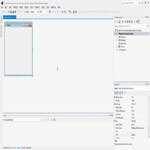 We could simply use Notepad for example, but a good code editor that supports Python will make us code easier and more efficient with features like IntelliSense and debugging. There is an IDE available just for Python named PyCharm, but my editor of choice is Visual Studio Code also known as VS Code, which is compared to PyCharm a more of a lightweight version of the IDE. To get the latest VS code, visit the official website at https://code.visualstudio.com/. For the latest stable build, simply click on the green "Download for Windows" button. For other platforms or if you want to try the newest prerelease features available in Insiders version, click on the "Other platforms" and "Insiders Edition" links. Here, make sure that the checkbox is selected for "Add to PATH" (it is by default). That way, the Visual Studio Code can run from any location. 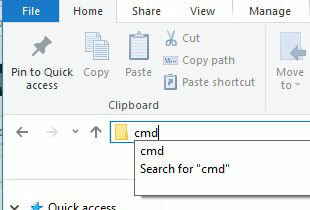 I would also suggest to add a checkbox for Add "Open with Code" action to Windows Explorer for both file and directory context menu. 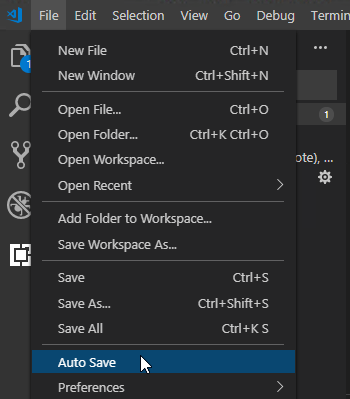 With these options, we can run VS Code directly by simply right-clicking on the file or folder inside the Windows Explorer. Next, the window will show listing all the options we selected in the previous steps. Click Install to proceed. After installation is complete, click "Finish". Now, let's focus on creating our first project in Python using Visual Studio Code. 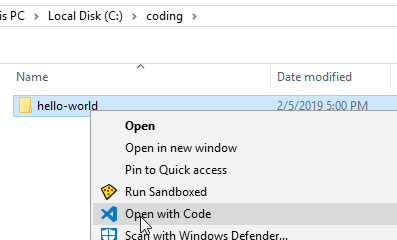 Note: This option shown above is only available to you if you selected Add "Open with Code" action to Windows Explorer option when installing Visual Studio Code. 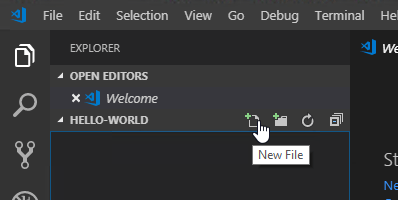 This will open Visual Studio Code in current folder. Now, let's create a simple Python program. In our case, we name it hello.py. Make sure, it ends with .py extension. 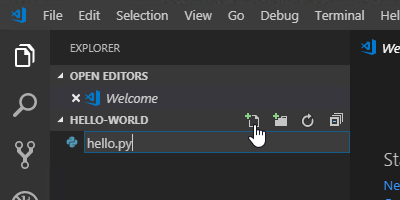 That way, the VS Code knows, we will be coding in Python. 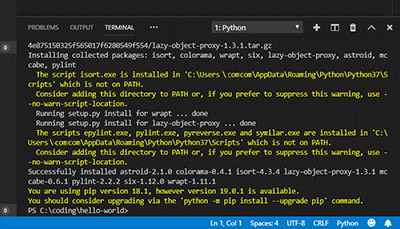 Since this is the first time we created a Python script in the Visual Studio Code, at bottom right corner you should see a suggestion to install a Python extension. Now, the VS Code should suggest you to install a linter pylint. Wait for it to complete the installation. Now, that we are finished installing the recommended extensions, let's focus on our code. Note: The VS code terminal defaults to PowerShell for Windows 10 and Command Prompt for older Windows, so the terminal is nothing special. Running commands on a terminal in VS Code is the same as if we opened a separate PowerShell / Command Prompt window and ran the commands from there. Congratulations, you just made a first Python program in Windows. Next, let's focus about the Python packages. When you start creating more and more projects, the versions of packages that these projects need will start to clash. For example, you created a project A and you installed a package for it. Now you create a project B which also needs same package, but it needs a different version than the one already available. Also remember that packages usually depend on other packages too, so eventually, you will come across this problem. To avoid these conflicts, we can make use of Python virtual environments which help us to isolate each project. For more information about them and how to use them, check this article. If you are a beginner at Python programming, there are many books about this subject. The Head First series are always good, so check out the Head First Python. Another one to check it out is the Python Crash Course. 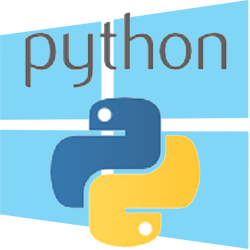 Python is a very versatile language, but to start using it on Windows, we need to install the necessary tools. 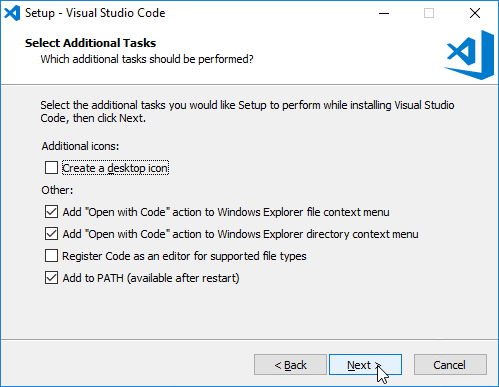 In this article, we first installed Python itself, then focused on installing Visual Studio Code editor. Next, we created a new project, made a simple script inside the project and run it from the terminal. 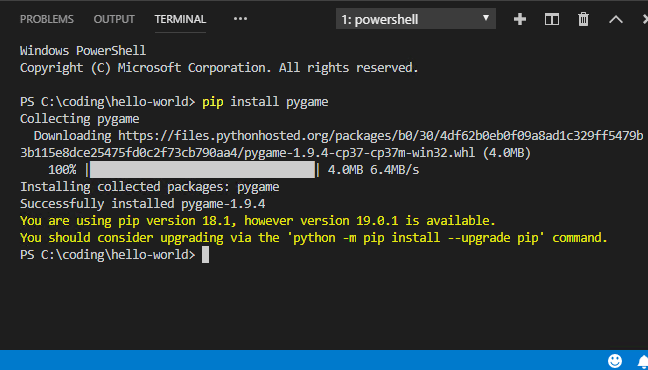 Finally, we examined the pip command line utility, which is used to install 3rd party packages and touched a bit about the Python environments.